Power up the camera by plugging the power cable from the camera to a charged USB battery / powerbank. Position the camera in a good place to spot wildlife, trying to avoid busy backgrounds. 1. 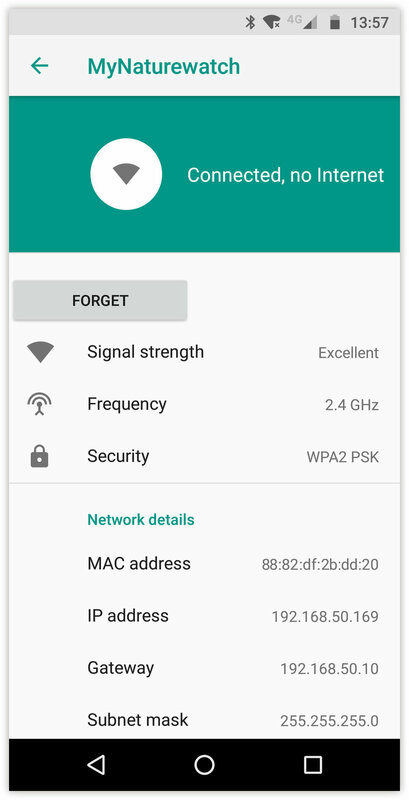 Using wi-fi settings on your device, search for the wi-fi network name created by your My Naturewatch Camera. It will have the default name of 'MyNaturewatch' with the default password of 'badgersandfoxes' or it will have the name and password you entered in the configuration file when building your camera. 3. The My Naturewatch Camera takes photos by continuously monitoring the live preview feed for movement. When you want to begin this process, press 'Start Image Capture' button. The camera will now taking pictures automatically and the button will change to a red 'Stop Image Capture' button. All the recorded images will be stored within the Image Gallery. Press the 'Stop Image Capture' button to cease capture. The live preview feed in the browser window is useful to setup your camera and frame the area you want to monitor for wildlife, but it is not intended for continuous use. 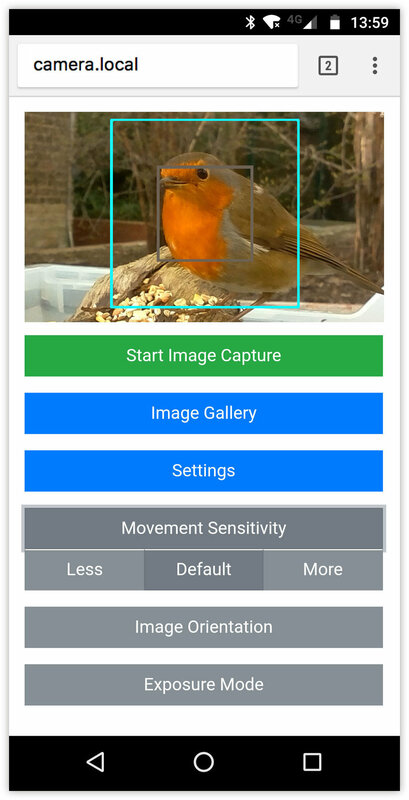 Once the My Naturewatch Camera has been setup and the image capture begun, disconnect by closing the web browser window, whether on phone, tablet or computer. Keeping the live preview feed open in the browser will drain the battery and put extra strain on the Raspberry Pi which could lead to overheating issues. 4. The My Naturewatch camera takes photos by looking for a significant change in what it can see. The square outlines on the preview image above represent the size of change the camera looks for to determine whether or not to take a photo. The sensitivity of the camera can be altered to prevent false positives – unwanted pictures taken when there is no wildlife in the camera frame. The small grey square symbolises the smallest change and the bigger cyan square the largest. In the default setting shown above, the grey square is about 15% the size of the overall image, meaning the camera will take an photo each time the camera sees at least 15% change across the whole image. To adjust sensitivity, click Settings > Movement Sensitivity. Selecting 'More' will decrease the size of the grey square so that the camera looks for very small changes, however this could increase the number of false positives if there is background motion (such as rustling leaves). Selecting 'Less', will increase the size of the grey square but could lead to wildlife being missed. Altering the sensitivity of the camera is a trial and error process, but a good tip for setting up your camera is to try and position it so that the background has as little movement (trees, bushes, cars, people) as possible. 5. Depending on how you built you My Naturewatch Camera, the live preview feed may appear upside down. To correct this, click Settings > Image Orientation > Flip 180. 6. By Default, the My Naturewatch Camera is set to automatically control the exposure of the image. However the exposure can be set manually if the scene has mixed lighting conditions, or if you would simply like to modify the shutter speed to create different effects. To switch to manual control, click Settings > Exposure Mode > Manual. Moving the slider allows you to select a number of different shutter speeds and clicking the button 'Update Manual Settings' sends the setting to the camera. 7. Pressing the 'Image Gallery' button on the main screen will lead to a new page showing all the pictures the camera has captured. On a phone, save photos by tapping and holding on them. Once you have saved the ones you want, delete the photos from My Naturewatch Camera by clicking the 'Delete All Pictures' button. 8. On computers, you also have the option to "Download All Photos". If you select this, the camera will add all the photos to a .zip file and send it to your computer. This can take a very long time if you have many pictures – and make sure you have sufficient storage space on your computer! 9. Don't forget to share! Post your pictures to Instagram and Twitter and don't forget to tag them with #mynaturewatch and #springwatch. See more on our gallery page and in the discussion Forum. Using a wildlife camera can be like fishing: sometimes nothing bites. Be patient and keep trying!